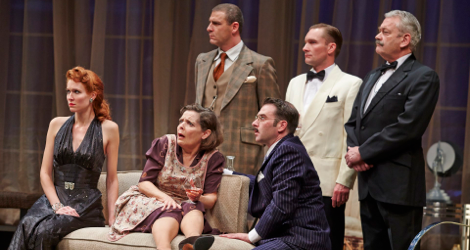 Theatre Aquarius has opened its 2014/15 season with a stylish production of that favourite Agatha Christie mystery, And Then There Were None. 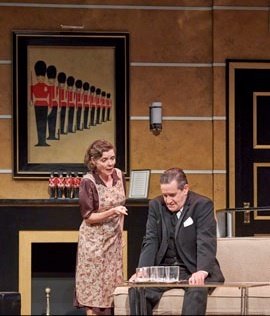 Well-cast, well-designed and well-directed, the show is staged at such a high level it is like getting a bonus Shaw Festival-like show after all the plays there have opened. Indeed, the Shaw Festival did stage the play once back in 1993. And Then There Were None is Christie’s 1943 adaptation of her 1939 novel originally titled Ten Little Niggers, after the British blackface minstrel song of the same name. Judged offensive, the first US edition in 1940 changed the title to the last line of the song, “And then there were none”. Later, one US revival changed the name to Ten Little Indians, a title many will still associate with the work, but since that title was also offensive, And Then There Were None finally in the 1980s won approval from the Christie estate as the official title of the novel and the play. The ten characters who are so important to the rhyme and to the imagery of the play became “soldier boys”. The novel is not only Christie’s best-selling mystery but the best-selling mystery novel of all time. The principal reason for this is the novel’s extraordinarily ingenious plot that has since spawned innumerable imitators. It is, therefore, very satisfying to go back to the original which Christie adapted with full knowledge of how to make the book most effective on stage. Many will already know the story either from the novel itself or from the famous 1945 film adaptation by René Clair. Eight guests have been invited to an isolated island off the Devon coast by a person identified as U.N. Owen. Two new servants have arrived the week before to take care of the house and serve the guests. Once the guests arrive, they learn that their host’s arrival will be delayed. After chatting amongst themselves it transpires that none of them, including the servants, have ever met a Mr. or Mrs. Owen, and none of the eight guests, all from very different backgrounds, have ever met each other. On the mantlepiece in the living room where all the action is set is a group of ten china figurines of soldiers along with a copy of the “Ten Little Soldier Boys” song, wherein, one by one, each of the soldiers dies in a different way. Once all ten characters have gather in the living room, a recorded voice announces that they have all been summoned to the island to pay for their crimes since each one is guilty of murder. One by one the voice calls the names of the guests and announces details of the murder he or she is guilty of. Naturally, they are all taken aback, though some admit to the circumstances that mysterious U.N.
Owen, i.e. Mr. Unknown, alludes to, while other do not. Before the accusations have completely sunk in, the first person dies, starting off a sequence of deaths that imitate the manner of the death of each of the soldier boys in the song. Not only that, but there is no telephone in the house and no boat on the island, so that the ten are trapped together with the unnerving fear that one of them must be the murderer. This last fact is what makes this particular mystery so theatrical. Christie’s play underscores the piquant mixture of comedy and dread when the microcosm of society on stage is forced to interact despite having lost the sense of trust that makes society possible. Basic questions such as what one eats or when one sleeps become fraught with danger. Though the play is primarily an entertainment, it unavoidably provides a critique of the every-man-for-himself notions of how societies should operate. In a stage mystery which, like a farce, is more concerned with plot than character, the actors’ main goal is to make an indelible first impression since they may be given little chance for character development. In this mystery especially, actors also have to suggest some trait that could mark them as a possible suspect. In order not to reveal too much about the story, I will discuss the characters in order of their appearance, not their disappearance. When the curtain rises Michael Lamport as Thomas Rogers and Karen Wood as his wife Ethel are already on stage. The two servants are put out that Mr. and Mrs. Owen will not be arriving and Ethel, who is a cook, is unhappy that there are no other servants so that it seems she and her husband, a butler, will also have to do cleaning and other household chores. Wood shows us Ethel’s irritation shading into unreasonable anxiety from the start, while Lamport lets us know that Thomas is use to the role of calming her down even while he has his own hidden misgivings. The third character to appear would normally be Fred Narracott, the man to delivers supplies to the island every day. Director Ron Ulrich has eliminated him, likely because he would be an eleventh character, not one of the invitees and has very little to say. The only disadvantage to cutting the part is to allow the suggestion to linger that someone other than the ten on the island is the murderer, but since that is hardly major point it’s just as well to have one less red herring. The first two guests to arrive are Vera Claythorne played by Andrea Runge and Philip Lombard played by Cameron MacDuffee. MacDuffee, whose character responds to stress through humour, is excellent at presenting an attractive devil-may-care exterior while suggesting that that exterior may only be a façade. Runge makes Vera vivacious but so sincere that she does not project the same double nature as does MacDuffee. All the remaining guests arrive in quick succession. 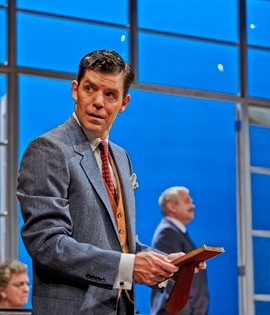 Tim Funnell instantly makes us view his character Anthony Marston as a callow young man whose predilection for speeding is perfectly in line with his general self-centredness. Kyle Dadd’s performance is problematic. His character is first announced to be a South African millionaire but he soon is revealed to be a local police inspector, William Blore. Dadd’s over-emphatic acting and dodgy South African accent suit his character as the false colonial millionaire but he does little except switch to a dodgy British accent when his identity is discovered, while his acting style remains the same and contrasts with the general restraint of the rest of the cast. the General’s grief over his wife’s death has started to push him mentally over the edge so that he occasionally mistakes Vera as his wife. Christie doesn’t allow her characters much time to develop, but Bekenn manages to deepen his portrayal by bring poignancy to the General’s loneliness. Skilton’s Emily Brent is just the opposite. Knitting constantly and puritanically commenting on the loose ways of youth today, she seems like Miss Marple’s negative alter ego. Skilton uses Brent’s general uncooperativeness and judgmental nature to make us suspect that like Miss Marple there is more to this old lady that meets the eye. David Schurmann, eloquent as always, is an excellent choice for the Justice Wargrave and like a person who feels himself superior to others makes it perfectly logical that the Justice should organize the others to compare notes and that the others should accede to his authority. The last to arrive is Dr. Edward Armstrong played by Jacob James. James makes the most of the paradoxical nature of his character – a nerve specialist who himself is plagued by nerves – something the doctor is aware of when he says of himself, “Physician, heal thyself”. Patrick Clark has designed one of the most handsome sets to grace the stage at the Dofasco Centre. It is a spacious Art Deco room, with windows and French doors opening to a sea view at the back. The Art Deco Burgh Island Hotel in Devon was Christie’s inspiration for Mr. U.N. Owen’s house, and one wonders if it was also Clark’s inspiration for his gracious design. The text specifies that there should be a set of ten figurines of soldiers in the room. Clark has emphasized this further by adding an Art Deco-style print of a line-up of ten beefeaters placed over the fireplace. His period costumes admirably suit each character’s personality, and his array of gowns for Vera Claythorne is quite stunning. Ron Ulrich has directed the action with an unerring sense of pace. The piece builds up slowly until the inevitable conclusion when there are only two people left alive, each assuming the other is out for murder. Ulrich has had the amusingly grim but helpful idea of projecting the verses of the song relevant to the recent demise of various characters on the curtain that descends between scenes. Since 2008, Theatre Aquarius has opened its season with a play that falls within the mandate of the Shaw Festival. This is has been an excellent idea since people going to the Shaw can easily add a trip to Hamilton and thus add another Shaw Festival-like play to their theatre trip. 2002 was the last year the Shaw Festival staged a conventional mystery, a genre that was one of the Festival’s most popular offerings. Theatre Aquarius can thus, as here, fill in the gap that programming at the Shaw has left and, with the quality as high as it has been, these opening plays serve as an excellent introduction to what Theatre Aquarius can achieve. Photos: (from top) Andrea Runge, Karen Wood, Kyle Dadd, Jacob James, Tim Funnell and Anthony Bekenn; Karen Wood and Michael Lamport; Jo Skilton, Cameron MacDuffee and Anthony Bekenn. ©2014 Daniel Banko.